This beer marks two interesting trends, as far as I see them: (1) we now have more (great) IPL entering the market (it's still far from saturated), and (2) another IPL from Temecula (currently half of the production-scale IPLs I know of are from there). 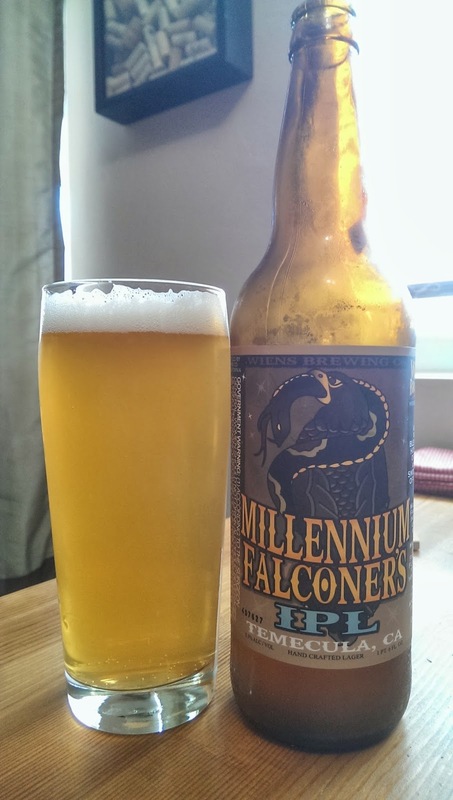 The Millenium Falconer (how cute, another Star Wars pun) begins with an almost overwhelming hop bitterness, but finishes with nice fruity hop notes which set's it apart from Nuhell and Fathom. There's only a faint hop aroma, but it's just enough to tease. It's got a great color, with a nice fluffy head layered over a mild lager base. Overall I find this to be a well-crafted brew. It pleases the tastebuds, and is fun to drink; but, the low ABV means it can't quite compete with the Fathom gold standard. With a little time Wien's may be able to reduce production costs, and if so I hope to see a better NSP.